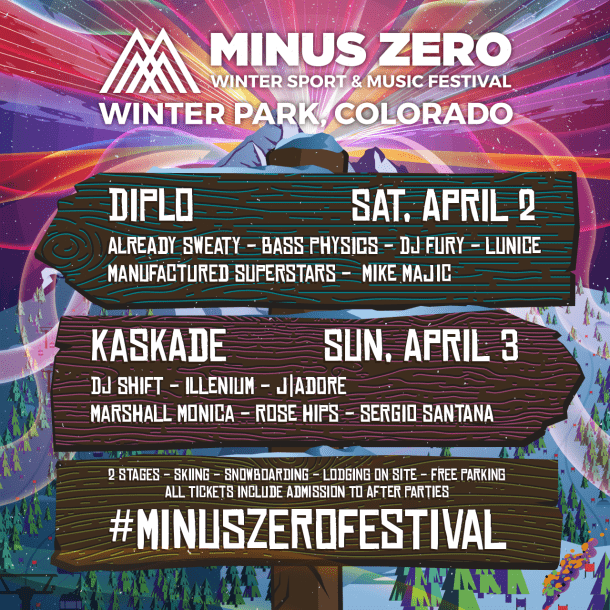 MINUS ZERO’s 2016 kickoff in Colorado will feature headlining sets from Diplo and Kaskade and over 15 other DJs across two stages, including Lunice, Manufactured Superstars, Illenium, Bass Physics, DJ Shift and local support acts (see day-by-day artist lineups below). All ski lifts and slopes at Winter Park Resort (an all inclusive site featuring lodging and hotel accommodations) will be open and festival attendees are encouraged to wear their ski/snowboard gear. The festival has partnered with Las Vegas-based entertainment firm, Silent Partner Entertainment Group, for all booking and marketing needs and with BETA Nightclub to help promote the event locally. Tickets for Denver go on sale Thursday (2/11) at 10:00 a.m. PST at minuszerofestival.com, starting at $95 for a day pass or $175 for both days. Lift passes and VIP options are also available. As a thank you to their customers Minus ZERO has ZERO service fees. Ticket prices are all inclusive and will not have any additional fees. MINUS ZERO FESTIVAL will run from 11:00 a.m. until 10:00 p.m. daily and is open to those 18 and over. VIP areas will include unique outdoor amenities and after parties with packages that include unlimited access to ski lifts. The picturesque backdrop at each one of these resorts will provide the perfect setting for this magnificent event. Fans and sports enthusiasts alike are encouraged to plan ahead so they are able to enjoy not only the wide variety of music, but also the incredible sporting facilities these world renowned and first class resorts are known for.